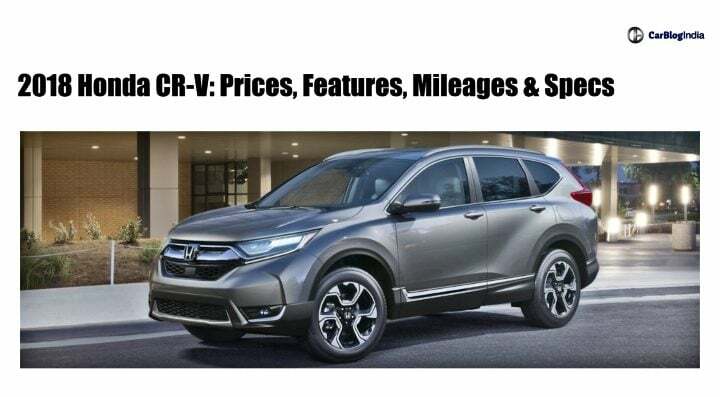 2018 Honda CR-V was launched in India at a starting price of INR 28.15 lakh (ex-showroom). The top-end variant of this full-sized SUV from Japan will set you back by INR 32.75 lakh. Falling in the aforementioned price range, the Honda CR-V competes with the likes of Toyota Fortuner, Ford Endeavour and the upcoming Mahindra Alturas SUV. For this generation of the CR-V, Honda, for the first time in India, has introduced this SUV with a diesel derivative. Not only this, but both the petrol as well as the diesel CR-V are available with automatic gearboxes. Interested in knowing more about this SUV? Read along as we bring you all the information that you need to know about the all-new CR-V.
As mentioned before, the 2018 Honda CR-V will retail in India in a total of three iterations. The petrol derivative, with a 2WD set-up, is going to cost INR 28.15 lakhs to own. On the other hand, the diesel derivative with 2WD set-up is going to cost INR 30.65 lakhs to own. The diesel derivative with a 4WD set-up is going to retail at INR 32.75 lakhs (ex-showroom). As you must be aware, the fifth generation Honda CR-V comes to India, for the first time, with both petrol as well as diesel derivatives. The petrol iteration of this full-sized SUV gets a 2.0-litre, 4-cylinder i-VTEC engine. This engine is capable of churning out 154 BHP along with 189 Nm of peak torque. The diesel derivative, on the other hand, comes with a 1.6-litre i-DTEC unit. This motor is capable of producing 120 BHP along with 300 Nm of peak torque. The petrol derivative comes with a CVT automatic gearbox. However, both the 2WD and 4WD diesel derivatives get a 9-speed torque converter unit. As mentioned before, the 2018 iteration of the Honda CR-V will retail in India with a choice of both petrol and diesel engine options. The 2.0-litre i-VTEC petrol engine is expected to give a mileage of 14 km/l. While the 1.6-litre diesel engine has a fuel efficiency of 18-20 km/l. Dimensionally, this flagship SUV from Honda is going to measure 4,592 mm in length, 1,855 mm in width and 1,689 mm in height. This SUV has a wheelbase of 2,660 mm. While the ground clearance stands at 198 mm. The CR-V boasts of a boot capacity of 150-litres with the third-row up-right. Meanwhile, for the 5-seater petrol variant, the boot capacity stands at 522-litres. The new CR-V will offer features like a TFT LCD instrument cluster. The centre console features a 7-inch touchscreen infotainment system that offers navigation facility. Not only this, but it also comes with Apple Car Play and Android Auto connectivity. The SUV also offers automatic climate control, heated seats which are electrically adjustable among the others. The latest iteration of this premium urban SUV is going to come with a wide array of safety features. These will include six-airbags, Electronic Stability Program, Anti-Lock Braking System, Traction Control, Reverse Parking Sensors, Rear-View Camera among the others. The exterior design of this SUV is completely different from the last generation model. The design is very sharp and looks futurist. In traditional Honda fashion, the exterior profile of the is very sleek, despite the CR-V is a full sized SUV. Up-front, you get wrap-around headlamps with LED elements. A thick chrome grille adds to the dominating front fascia. Looking at this SUV from the side is when you get the hint of this vehicle’s previous generation models. At the back, you once again get a sharp design with L-shaped tail-lamps and a stout yet sporty bumper design. Being a premium vehicle and at the same time a Honda, the interiors of the CR-V looks very plush. The colour scheme is black with silver and contrasting colour accents adding to the overall appeal of the SUV. It is bound to get leather upholstery along with a leather-wrapped steering wheel. As mentioned before, the CR-V is now available in a 7-seat configuration. Honda Car India has launched the new CR-V with just one variant in India. The only difference between the three iterations is the power and drivetrain options. The latest iteration of this premium SUV, when launched in India will fall in-between the price tag of INR 25 lakh to 30 lakh. With this, it will compete against the likes of the Volkswagen Tiguan. Skoda Kodiaq and the upcoming Hyundai Santa Fe.